Dry air can have an unfortunate impact on your skin, eyes, and respiratory system and sadly dried up mucous membranes lose their ability to protect you from the viruses and bacteria when the cold and flu season kicks in. Cold air can’t hold as much moisture as warm air does, that’s why in the winter you often wake up with a dry and stuffy nose and have to deal with cracked skin on your hands. One of the best ways to avoid these dry air side effects is to buy a humidifier. The problem with using just a humidifying device on it’s own (without filtering the air) is that the extra humidity you’re now producing can also help to breed and encourage mold spores and bacteria to grow, which is why doctors recommend using both a humidifier and air filter together in those dry winter months.Even the best air purifier in the world, will struggle to help your winter allergies if the air is too dry. Since purchasing two units for your home is a costly way out, the manufacturers came up with a 2 in 1 air humidifier and purifier Combo product that takes care of keeping the air nice and fresh whilst also boosting the moisture levels. When the winter came, I decided to review a few of the 2 in 1 devices to see if they really work. After doing some research I came up with 4 units that seemed to be a cut above the rest. 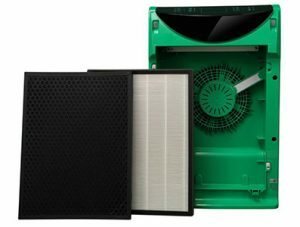 This particular model intrigued me due to its 7-stage purifying system and a dust sensor.Usually in these dual machines you don’t get so many different filters. With all the features it offered, it seemed a good buy for the money. Another advantage of this unit is the manufacturer’s claim that it can service fairly large areas. 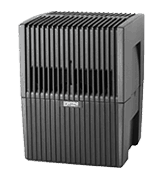 Typically with air cleaner and humidifier combos, you tend to find that one feature is better than the other…I’d heard rumors that the Dreval D850 could do both very well – so I just had to review this one as up until now I have never found one equally adept at purifing the air at the same time as humidifying it. 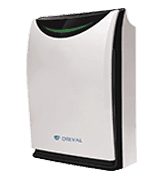 The Dreval D850 features 4 different air filters plus UV Sterilization and a built in Ionizer. First up is the Activated Carbon filter which absorbs odors and collects large particles from the air. The Cold Catalyst filter deals with formaldehyde, ammonia, hydrogen sulfide, and many other harmful gasses that can be released by furniture, carpets, and bedspreads. It effectively turns the dangerous gasses into water and carbon dioxide and it only needs to be replaced once every 5 years. Next up is the AntiMicrobial filter which uses antimicrobial agents to fight harmful bacteria. 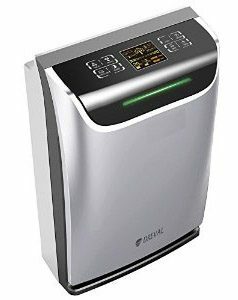 And finally, the dreval houses one of the most high-efficiency HEPA filters around, which captures 99.97% of all the harmful airborne particles larger than 0.01 micron, including dust, pet dander, pollen, mold spores, germs, and more. UV light is proven to kill a large variety of bacteria. On the D850, the UV lamp is an optional feature that can be turned on and off as you wish which can help you to save on replacement fees as the UV bulb need to be replaced every 1 to 2 years depending on the use. The built-in ionizer creates negative ions (anions) that negatively charge the oxygen which results in positively charged harmful particles. Once these particles get a positive charge, they become heavier and sink to the ground. They also become easier to capture for the rest of the filtration system. This feature is also optional. 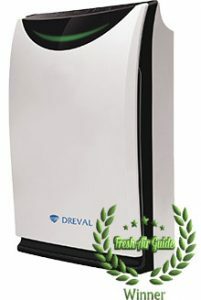 I was satisfied with the built-in humidifier feature since the reviews show exactly what I was looking for; The overwhelming majority of reviews highly commend the dreval D-850 for having good and effective coverage. It eliminates the dryness from your nose during the night whilst making very minimal noise, so your sleep shouldn’t be disturbed. This unit will help you wake up feeling better and fresher than you ever would with just a simple air cleaner. You can also add some aroma oil into the water reservoir and the air in your room will fill up with an amazing smell. So you can use this humidifier for aromatherapy too! The unit is equipped with an air quality sensor. The air cleaner adjusts the fan speed in accordance with the current level of air contamination. When you first turn it on, the LED panel lights up red and the highest fan speed should kick in. After several hours it will turn yellow, which means the air quality is now normal and the fan speed automatically gets adjusted down to the medium level. After running for several hours, the light finally changes to green. It will then vary from green to yellow throughout the day. This is one of my favorite features here. The sleep mode utilizes the lowest fan speed and a completely dark control panel. Even if the air quality indicator switches from red to yellow, the sleep mode will keep the air filter from upping the fan speed. This is a wonderful feature for light sleepers like me. The unit comes with an easy-to-use remote control which is a nice bonus for those who don’t like to get off their couches to tune the air filter. Low fan speed is really quiet and shouldn’t interfere with your sleep. The medium and high fan speeds are rather loud but since you’d probably only use them during the day, it shouldn’t a problem. If you are planning to install this unit in the bedroom, I would recommend turning it on for the first time in the morning. Otherwise, it won’t be able to clean the air well enough for the quality sensor to tell the fan to reduce the speed. The unit comes with a 2-year warranty. It seems too short for my tastes. I prefer buying products with at least a 3-year warranty. A 2-year warranty makes me doubt the unit quality a little but Dreval have a good brand name for quality and reports suggest the D850 is a well built device that shouldn’t necessitate activating the warranty. Overall, I am extremely impressed with the options and features this unit offers. It represents the best value combo device on the market – which is why it ended up as my winner for the air purifier and humidifier in same room catagory. I would prefer the water tank to be a little larger in order not to add water every day. It would struggle with large rooms and basements for this reason, but most combo products suffer from this problem too. The only reservation I really had was the warranty. 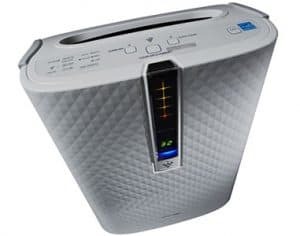 However, as I stated earlier, Dreval have a good reputation for making solidly built devices and I browsed different customer reviews and found that there were no major complaints when using this unit longer than 2 years. I chose this particular model for my review since it’s completely different from anything I checked out before. 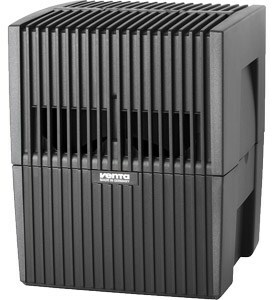 The Venta LW15 is not an air cleaner with a humidifier but the other way around. It has a special no-filter cleaning technology which is a real money-saver.There are 3 different models, designed for spaces ranging from 200 to 800 sq ft and the manufacturer claims near silent operation. The LW15 is the perfect mix . It is equipped with internal disks that catch the harmful particles and then trap them with water. As a result, you are getting clean air with water mist. Accordingly, while getting purified the air is also humidified. Sounds fantastic? Not exactly. Whilst the Humidifier is excellent and above the normal standard on these combo products, the air cleaner is not a match for some of the better devices in the field. It houses filters that are good for catching large particles. Smaller particles, such as pollen and mold spores, might not be trapped as efficiently. 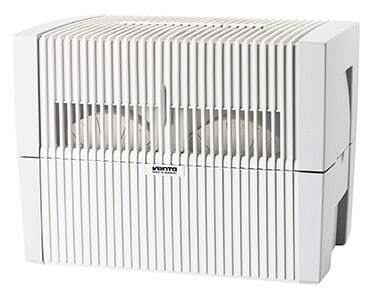 The airwasher technology is far from HEPA. Which means that it might not be suitable for people who suffer from severe allergies or asthma. Another disadvantage that I see here is that you can’t use the two features separately which might not always be useful, especially during the summertime. The unit is equipped with 1.2-gallon water tank which is pretty big. It means you won’t be forced to add water more often that about two times a day depending on the way you use the airwasher. Special attention should be paid to the unit’s maintenance. Since it uses water for filtration, it gets dirty rather quickly. While the manufacturer recommends cleaning the airwasher once every 2 weeks, in reality, it should be cleaned about once a week. The main danger of using a humidifier is mold formation. 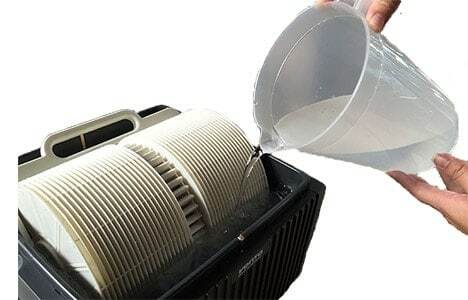 Accordingly, the unit must be cleaned as thoroughly as possible, but it can be hard to clean the plastic disks inside the machine. The longer you wait for cleaning, the harder it will be to get the dirt out. Even though there are no filters to replace, the unit still requires some maintenance expenses on your part. You can get the best results cleaning the airwasher if you buy the recommended water treatment additives. The Venta LW15 is equipped with a low water indicator. It also has an auto-shutoff feature that turns the airwasher off when it runs out of water. Unfortunately, the unit is not equipped with a humidistat so you can’t tell when the humidity levels are good enough to turn the machine off. There is no remote control, however, there isn’t much to control. All that’s adjustable is the fan speed. This unit is rather small which makes it easy to place virtually anywhere, including a coffee table. The air intake is done from all around the machine so it can’t be installed against the wall. The design is far from being sleek but that’s compensated by the model’s compact size. It comes in two colors: dark grey and white. This unit has three fan settings. 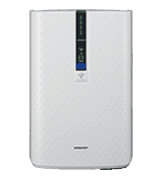 As is the case with most purifiers, the lowest fan setting is the quietest and is great for the bedroom. The other two are pretty loud. The third fan setting can even interfere with your work. However, since the unit is rather compact, you can easily place it in a far corner and forget about the loud noise. Some users also report hearing clicks that are probably caused by the way the disks rotate inside the unit. Venta products are made in Germany and come with a 10-year warranty. As I said earlier, a long warranty is usually an indicator of a product’s quality. However, if you need to replace it, you’ll incur shipping costs. 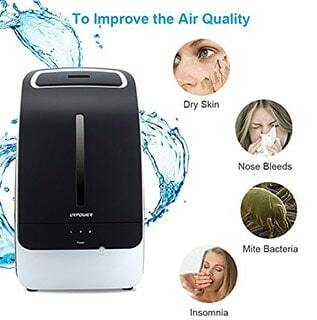 Overall, I would recommend this unit to people who don’t suffer from allergies or respiratory problems but still want clean and fresh air in their homes. I would say that this machine is really more a humidifier than a purifier. 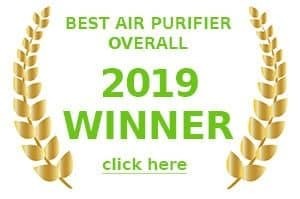 Which makes it stand out from the crowd that usually focus on being an air purifier first and humidifier a distant second. The price is a bit high for device that doesn’t really do both jobs well. However, you will save money on replacement filters and energy. I picked this unit to review for its ultrasonic humidifier feature which is a pretty unique feature. The Oreck WK1500B is only designed to cater small rooms. It has a two stage filtration system and is equipped with a humidity sensor. The power can be adjusted up and down in accordance with your desired level of air moisture. This unit is ‘ultrasonic’ which means it releases nice and cool mist into the air. After turning this feature on and letting the unit work for a couple of hours, you should notice the difference. The Oreck WK1500B produces visible mist. The humidity sensor on the control panel shows when the levels fall and the unit automatically increases the power. You can also adjust the humidifier manually as well. One feature I really appreciated was the water level indicator that lets you know when you need to add water to the reservoir. The real downside of this wonderful humidifier option is the cleaning part. The manufacturer recommends it to be done on a weekly basis. Cleaning the tank is easy, but cleaning the unit itself is complicated since there is a drain in the bottom part where the water comes out. You will need to find something to put beneath the unit to let the water drain. One strange feature I noticed that might be a disadvantage for some users is that you can’t run the humidifier without the air purification but you can run the purifier on it’s own. Compared to the other air cleaners I reviewed so far, this one’s filtration system is simple. It has an activated carbon filter and a HEPA filter. 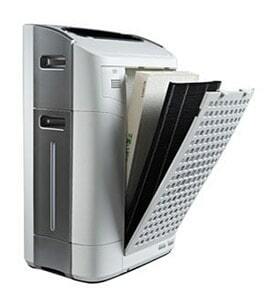 The first one takes care of the odors, the second one deals with the allergens, mold spores, and bacteria. The carbon filter needs to be replaced once every 3 months. HEPA needs to be changed every 9 – 12 months. After about 5-7 hours of work, the air in the room should significantly fresher with ample amounts of humidity. When you use this air cleaner for the first time, you might notice a chemical smell for several hours. This “break in” smell is normal for such units and should only bother you if it doesn’t go away after 1 day of use. I appreciate the tower design of the Oreck WK1500B since it takes up little space. It’s rather tall so it can’t be hidden behind a couch but it’s not a problem since the design is sleek and it can be a good addition to most decors. You can quite easily place it on the floor or a desktop and it won’t look out of place. I also liked the display that showed all the necessary information, including the humidity levels, the filter condition, and the water level. This unit has a sleep mode which all the light sleepers can appreciate. The fan setting automatically changes to low and the lights on the control panel dim. This is a great advantage over some units I reviewed that have the LED lights shining bright all through the night. This unit is rather quiet on the low fan settings and produces some white noise even when in sleep mode. This seems to be an advantage to most sleepers. However, those who like to sleep in complete silence might not appreciate it. Once the fan settings are adjusted to medium or high, the sound becomes pretty loud and can interfere with your sleep if placed in the bedroom. Maintaining an air filter is usually easy. What you need to do is just change the filters on time. However, when you have the humidifier working, you need to clean the unit once a week. The cleaning process might take quite some time since it involves draining all the water and rinsing the unit. You would need to bring it to the bathroom to do a proper cleaning. Since the unit is not too heavy (it weighs only 15 pounds), this shouldn’t be a problem. Overall, I can say that this unit can satisfy the needs of a person who wants to buy an air cleaner and a humidifier for a small room. It has all the necessary features, including the sleep mode, to make operation easy and convenient. The main disadvantage is the price. This machine costs more than other similar models but services less space. Also, it only has a two-year limited warranty. 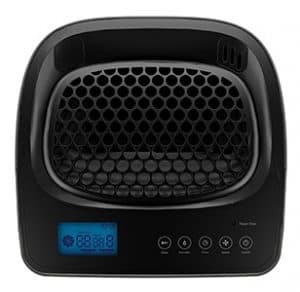 I chose this unit to review since it offers a humidity function that can be turned off and gets great reviews. The unit has a 3-stage filtration system and a large water reservoir. 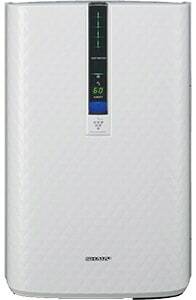 The most interesting feature is the Plasmacluster technology that I didn’t yet get a chance to review with any other air purifiers/humidifiers. This model is quite costly so I wanted to check out if it’s really worth the money people are paying for it. I paid special attention to this unique plasmacluster technology. It turned out to be a type of ionizer that’s patented by the Sharp company. The air filter emits positive and negative ions. They react with the water vapor in the air and oxidize the unwelcome particles, such as allergens and odors. The oxidation leads to the particle breakdown. Meanwhile, no harmful elements are released into the air. All this sounds a little far-fetched and sci-fi like, but most users report that they can smell the air becoming fresher. To get the best results, you should test the device with all the windows and doors closed. 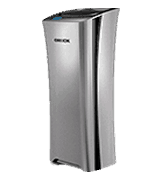 The Sharp KC-850U is equipped with a TrueHEPA filter that filters out more than 99% of the harmful particles. It also has a pre-filter to get rid of the largest particles and an activated carbon filter which deals with the odors. I appreciated the fact the both the pre-filter and the carbon filter are washable which would save me a lot of money on replacement filters. The pre-filter is permanent while the carbon filter needs to be changed only once every 5 years. The HEPA filter has to be replaced every 9 – 12 months depending on the use. 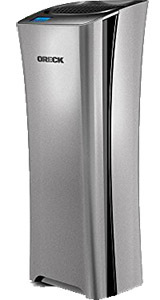 The overall design of the Sharp KC850U is good. However, there are a few disadvantages. The main one is that this purifier can’t be put against the wall since the air intake is done from the back. For best results, it needs to be installed as far away from the wall as possible, which makes it hard to find a place for it. The panel is nice and futuristic-looking and can be completely turned off, which is a big advantage for people who want to use the unit in the bedroom. This model is not too heavy. It weighs only about 20 lbs. and can be easily moved around the house. 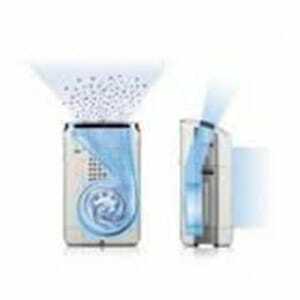 The main advantage of this humidifier feature is that it can be turned off and on whenever you need. The main disadvantage is the lack of power. The humidifier works only on the auto mode and the power can’t be adjusted. Overall, I would say that the humidifier is rather weak. If you live in a very dry climate, you’ll need to find something more powerful. This is my favorite part of this unit. The purifier is equipped with three sensors that detect and display the temperature, the air quality, and the humidity levels. Once the levels fall below normal, the unit ups the fan speed. This is a very useful feature since it’s nearly impossible to tell the slight difference between fresh and somewhat polluted air. When the KC-850U works on the lowest fan speed, it’s rather quiet but the Plasmacluster ionizer makes a barely audible constant clicking sound. The medium fan setting is also pretty quiet which was a pleasant surprise for me since most of the air cleaners are rather loud even on medium. Both low and medium settings can be used during the night without a risk of waking you up. However, I would still recommend placing the unit on the other end of the room. The highest setting is rather loud. It sounds like a hair drier which makes it impossible to use during the night. Even during the daytime, it seemed rather annoying. Thankfully, the highest speed is rarely used. Overall, I’m 100 % satisfied with the way the air filter works but only about 50 % happy with what the humidifier does. Thanks to the plasmacluster technology, the air smells amazingly clean and fresh. The unit emits little noise and is nicely designed. Another downside is a short 1 – year warranty and high price. Considering all the above, I would recommend this unit for people who are not suffering from overly dry weather conditions and want the air in their home to smell clean and fresh. 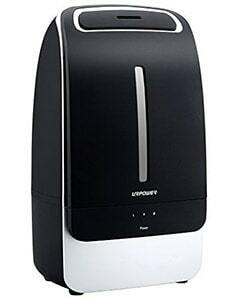 I chose the Urpower ultrasonic as the best budget air purifier and humidifier under $100. That’s cheap!.. and it offers a LOT for that sort of money. Whilst it can’t cover medium to large sized rooms, it is a cheap alternative to most other 2 in 1 units. It’s also rather compact and can be carried from one room to another easily. I liked the sleek design which makes it easy to fit this unit into any decor, be it your bedroom or your office. The 1.3-gallon water tank is large enough for the machine to work all night. It emits mist into the air and does a pretty good job keeping the humidity levels high. Since it is rather compact, it can be placed anywhere in the room to get the best humidifying results. It has an auto shut-off feature that turns the unit off when the tank is out of water. The optimal humidity levels are reached after about 8 – 10 hours of work depending on the initial air dryness. Even though the manufacturer claims that this unit purifies the air, I found no indications that it’s actually doing any purification job. The water filters clean the water inside the tank to produce fresh and cool mist. Perhaps this is what can make the air in your room fresher. After reading through dozens of reviews, I made a decision that this unit can only really freshen up the air. However, it doesn’t deal with pollen, pet dander, mold spores and etc. This device is virtually silent. It can be easily installed in the bedroom where it will work comfortably all through the night. Thanks to the large tank, you won’t be needing to add any water. It can easily work for 14 – 17 hours a day. There are two modes to control the mist. Both of them don’t produce almost any noise. Just like all humidifiers, this unit requires frequent maintenance. The tank and the machine need to be cleaned at least once a week in order to avoid mold formation. 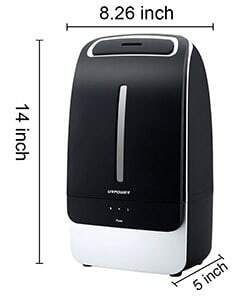 Since the humidifier is rather light, there won’t be any problems with placing it in the bathtub to do the cleaning. If you don’t use it too often, make sure to replace the water in the tank. I really like this unit’s design. It’s simple yet elegant and can blend in with virtually any décor. The machine is compact and weighs only 4.8 pounds. It can be placed anywhere in the room, even on a table. It’s equipped with a lift handle to make it easier to carry the unit around. The control panel is located near the bottom of the unit. There is no remote control. Overall, I’m satisfied with the way this unit works as a humidifier. Even though it’s rather small, it can keep a good sized room humidified without using too much energy. The main disadvantage of this device is the absence of filters for air purification. I would recommend this machine to people without any respiratory conditions who are looking for a decent humidifier at a moderate price.